To Lily met the expectations of the florist, you need to make great efforts to care for these majestic and graceful plants. Since purchasing bulbs, proper planting, watering and fertilizing, ending with shelter for the winter holidays – all this requires careful monitoring and attention. When buying bulbs, pay attention to their condition. Quality material should not have dark spots, mold or mechanical damage. Scales are good the bulbs are firmly attached to each other, they are dense and elastic to the touch. The roots are dried, their length is at least 4-5cm. For this plant the preferred autumn planting. Lily light, when choosing a place for lilies, consider this factor. Flower loves loamy soil and excess moisture. On the bottom of the planting hole place sand, peat and pine litter (old needles and pieces of bark) in equal proportions. The bulbs are position at a distance of 15-20 cm from each other and pour the same mixture. Planting depth bulbs should exceed its length 2-3 times. In the first year of flowering the plants remove all the buds below the bulb is well settled and gained strength. Lilies do not like watering the leaves, make it the root of the plants in the evening. 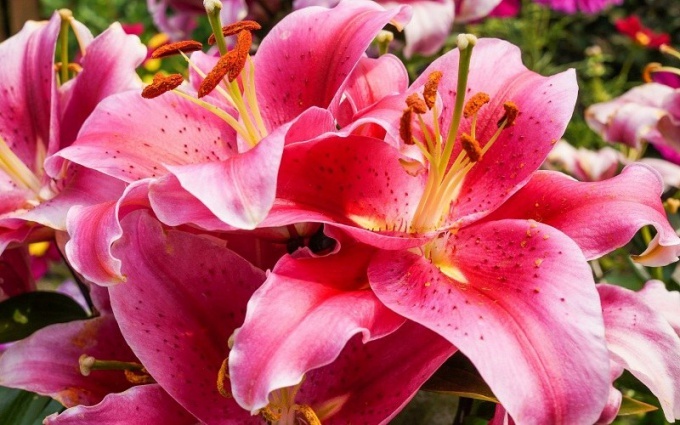 Frequent fertilizing with manure develops aboveground part of the plant, with the bulb not getting enough minerals and Lily does not bloom the following year. To avoid this, fertilize lilies only complex mineral fertilizers. Make humus as the mulch component, once per season. In one place to the Lily can grow up to 5 years, after which require division and transplant. Dig the plant with a pitchfork to avoid damage to the bulbs, separate the young, healthy bulbs. The roots of young plants, cut to 4-5cm Bulbs treat with a weak solution of potassium permanganate and put on the new site. Lilies are best winter in dry soil. Cut 10-15 cm above ground stems, cover with waterproof material at the end of October. Remove the material after the first frost. The ground above the bulbs cover with spruce branches or lutrasilom. In the spring, do not allow stagnation of melt water at the landing site. Cut lilies in the bouquet in Bud stage, the flowers no longer wither.